The intersection at Andersen Drive and Francisco Boulevard West will be closed each night from 7:30 pm to 6:00 am starting August 10, 2018 through August 13, 2018. The span of the closure will be from Francisco West (O’Reilly auto parts driveway) to Andersen Drive. The work being done to the intersection will consist of the removal and replacement of the top layer of asphalt and the re-striping of the intersection. It is important to plan and expect delays in the area. It is suggested that the public use Woodland Avenue as a detour around the area. Driveways of some business will be impacted during this process: Office Depot, Dollar Tree, and O’ Reilly. Depending on how the contractor performs the work. We have asked the contractor to stage their work so that affected businesses have access to their stores during business hours. The Sonoma Marin Area Rail Transit (SMART) District has been moving forward with the construction of their Larkspur Extension which is from downtown San Rafael to Larkspur Landing. Over the last 3 months SMART has closed Andersen Drive in order to install their new rail system and some new signal equipment in the area. Andersen Drive will re-open to vehicle traffic on July 5th. 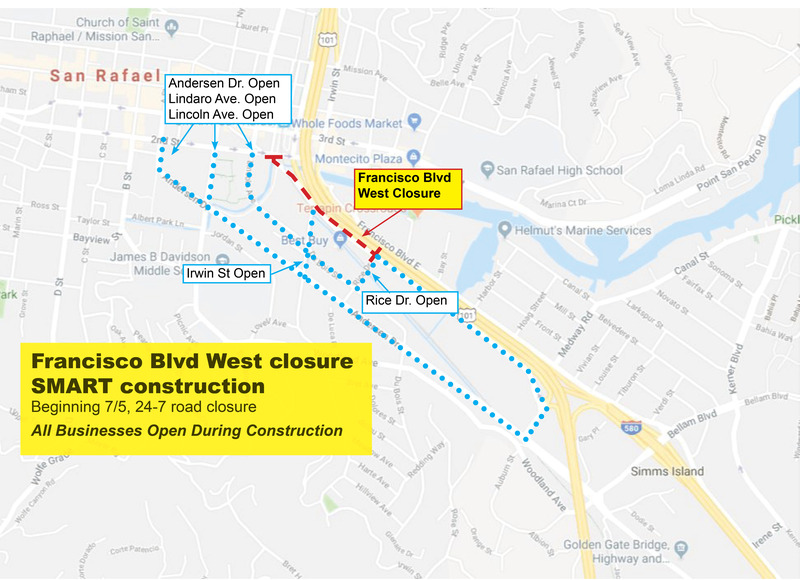 Some future paving of Francisco Blvd West at the Andersen Drive may occur later in the summer when the coordination of the work can be achieved with Caltrans. The contractor will continue to work in the area installing and testing their signals and other equipment associated with the future rail line. However, Andersen will remain open to the public after July 5th. As soon as SMART reopens Andersen Drive on July 5th, SMART will begin the work on realigning Francisco Blvd West. Francisco Blvd West will be closed from 2nd Street to Rice Drive beginning July 6th. SMART will be realigning the existing roadway and installing rail in this area for the next six months. Access from Irwin to Francisco Blvd. West near Staples will be blocked off for the construction. Access to businesses will be maintained throughout the construction. The construction includes the elimination of two rail crossings by “flipping” Francisco Blvd West and the SMART rail tracks–aligning the tracks closest to the freeway instead of the road. Doing this will eliminate two rail crossings will would have had to occur if the roadway wasn’t flipped. Eliminating the crossings will greatly improve safety once rail service begins. Construction along Francisco Blvd West will start with removal of the existing roadway. The area will be closed off until January 2019. Pedestrians and Cyclists will not be allowed through the area, and will be rerouted to Andersen Drive or Woodland Avenue. The rail crossing at 2nd and 3rd street will be closed as SMART continues to complete their work. When SMART begins the work on the rail crossing at 2nd Street and 3rd Street, there will be a full closure of either 2nd or 3rd street (closure will take place for only one street at a time). The will occur during the weekend and road will be closed continuously for 48 hours. Outside of this closure we do not anticipate much work or delay occurring on 2nd and 3rd due to the Larkspur Extension. Closure date will be announced once the dates are finalized. The City is working closely with SMART to have their contractor construct the Multi-Use Pathway which parallels the rail alignment from 2nd Street to Andersen Drive. The notice to proceed for this work was issued on June 15th. The City has moved forward with ordering steel and concrete piles that will support the pathway and we have met with contractor on several occasions to review the field constraints for the project. SMART anticipates driving piles as soon as they arrive in late July. Due to funding restraints the path will be constructed in two phases, beginning with the section which is most confined between Rice Drive and Andersen Drive. In addition to the work on Francisco Blvd West, there is an older wooden trestle system for the rail which crosses over Auburn Street adjacent to Bellam and Andersen. The existing rail system on this older trestle is scheduled to be replaced in the month of July 2018. In order to perform this work, the contractor plans to close Auburn Street to allow a crane to remove the material. The City requested that this work be performed on weekends in order to minimally impact residents and vehicles utilizing this area. The work is tentatively scheduled for the weekends of July 7th and July 14th. Detour signs will be in place while the work is occurring and the roadway will be opened to the public during non working hours.